Is back pain a common problem? More than 8 out of every 10 people suffer from one or more episodes of back pain during their lifetime. Hundreds of thousands of back surgeries are performed each year. It is one of the most common reasons for visits to their doctor. Which age groups are more prone to back problems? Can you explain the make-up of the spine in simple terms? - The Neck (Cervical) Spine with 7 Vertebrae. - The Shoulders to the Waist(Thoracic) Spine with 12 Vertebrae. - The Coccyx (Tail) Bone is the last part of the spine. It is made up of between 3 – 5 fused vertebrae. The spine is made up of 24 specially shaped bones called vertebrae. They are stacked one on top of the other, with the larger ones in the lower back section so as to support and carry the weight of the upper body. How are the vertebrae attached? They are attached to muscles, ligaments and the disc in between each vertebra. Why is the spine curved like an “S”? This curve is natural and should be maintained in that form by correct posture. The specific curvature makes the spine much stronger than if it were straight. In addition to which, the discs in between the vertebrae are quite flexible, which allows you to bend, turn, reach and swing with ease and safety. What is the “Disc” in between the vertebrae? What is commonly known as the “Disc” is the Intervertebral Disc which sits between each vertebra. They are gristle-like ligaments surrounding a jelly-like center. The front wall which faces to your front is normally thicker and stronger than the back section. The disc is firmly attached to the vertebrae and cannot move. The disc acts like a shock absorber and allows the spine to do all the movements that it makes day in and day out. How can the Disc be injured? Other than through an accident, the major cause is bad posture and lack of knowledge of how to walk, run, lift, carry, push, pull, lie, stand and so on. The disc can tear, in which case the jelly-like substance will flow out and cause the common condition known as a “slipped disc”, although the disc has not actually slipped at all. Tears within the ligament rings are called “herniated discs” and tears through the ligament rings are called “ruptured discs”. Can a Herniated Disc be treated and repaired? In most instances, the symptoms and disability from a herniated disc may subside over time and with the correct treatment. The problem will be if the symptoms persist. At this stage surgery may be required if the diagnosis is well established. Ligaments are strong, fibrous tissue bands that connect bones to other bones to form a joint. They do not connect muscles to bones; that is the function of tendons. Some ligaments limit mobility or prevent certain movements altogether. They are elastic and they lengthen when under tension. 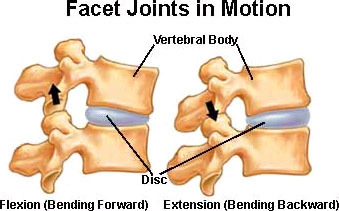 When this lengthening is not under control, the joint can be dislocated and should be reset as soon as possible. Athletes, gymnasts, dancers, and martial artists perform Stretching exercises to lengthen their ligaments which are a necessity for all sports and activities so as to make their joints more supple. What can be done for a Torn Ligament? A torn ligament will create instability of the joint. Not all torn ligaments need surgery, but if surgery is needed to stabilize the joint, the torn ligament can usually be repaired. Scar tissue may prevent this. If it is not possible to fix the broken ligament, other procedures can correct the instability. Instability of a joint could eventually lead to wear of the cartilage and osteoarthritis. Ligaments, tendons and muscles are like small ropes that help stabilize and balance the spinal column. 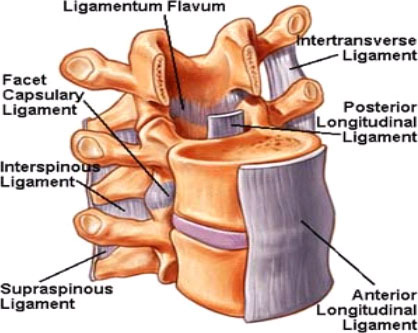 Spinal ligaments connect bone to bone, help hold vertebrae in place, and limit movement to help prevent injury. (Fig. 1) The spine's tendons connect bone to muscle and serve as anchors to aid muscles when they contract during joint movement. A tendon is a tough yet flexible band of fibrous tissue. The tendon is the structure in your body that connects the muscle to the bones. . They do not connect muscles to muscles; that is the function of ligaments. The skeletal muscles in your body are responsible for moving your bones, thus enabling you to walk, run, jump, lift, and move in many different ways. When a muscle contracts, it pulls on a bone to cause the movement required. The tissue that transmits the force of the muscle contraction to the bone is called a tendon. Tendons are not as elastic as ligaments. So how do the muscles, tendons and ligaments know what I want them to do? Let us assume that you want to scratch your ear. Your brain cells send a message through your spinal cord and motor nerves to the muscle cells that need to be activated. The muscles that bend your elbow are told to contract. Then the information returns to the brain from the muscles and joints, so as to regulate the amount of strength or force that is needed to bring your hand up to your ear. Then additional messages are sent to the muscles that will control how the fingers need to respond and what action they need to take. Now you are able to apply the exact movement and pressure required. If the system was not so exact, you could give yourself a black eye! The Spinal Cord is connected to the brain and is about the diameter of a human finger +- one inch. From the brain the spinal cord descends down the middle of the back and is surrounded and protected by the bony vertebral column. The spinal cord is surrounded by a clear fluid called Cerebral Spinal Fluid (CSF), that acts as a cushion to protect the delicate nerve tissues against damage from banging against the inside of the vertebrae. How is the Spinal Cord made? The anatomy of the spinal cord itself consists of millions of nerve fibers which transmit electrical information to and from the limbs, trunk and organs of the body, back to and from the brain. The brain and spinal cord are referred to as the Central Nervous System (CNS), whilst the nerves connecting the spinal cord to the body are referred to as the Peripheral Nervous System (PNS). The nerves within the spinal cord are grouped together in different bundles called Ascending and Descending tracts – a two way traffic flow. How do the Spinal Nerves know what to do? If there are so many nerve fibers surely they can get their messages mixed up? Nerves called the spinal nerves or nerve roots come off the spinal cord and pass out through a hole in each of the vertebrae called the Foramen to carry the information from the spinal cord to the rest of the body, and from the body back up to the brain. Both the nerves and the segments in the spinal cord are numbered in a similar way to the vertebrae. The point at which the spinal cord ends is called the conus medullaris, and is the terminal end of the spinal cord. It occurs near lumbar nerves L1 and L2. After the spinal cord terminates, the spinal nerves continue as a bundle of nerves called the cauda equina. At this point the bundles of nerves look like a horses’ tail. There are 31 pairs of spinal nerves which branch off from the spinal cord. In the cervical region of the spinal cord, the spinal nerves exit above the vertebrae. A change occurs with the C7 vertebra however, where the C8 spinal nerve exits the vertebra below the C7 vertebra. Therefore, there is an 8th cervical spinal nerve even though there is no 8th cervical vertebra. From the 1st thoracic vertebra downwards, all spinal nerves exit below their equivalent numbered vertebrae. The spinal nerves which leave the spinal cord are numbered according to the vertebra at which they exit the spinal column. So, the spinal nerve T4, exits the spinal column through the foramen in the 4th thoracic vertebra. The spinal nerve L5 leaves the spinal cord from the conus medullaris, and travels along the cauda equina until it exits the 5th lumbar vertebra. The level of the spinal cord segments do not relate exactly to the level of the vertebral bodies i.e. damage to the bone at a particular level e.g. L5 vertebrae does not necessarily mean damage to the spinal cord at the same spinal nerve level.